Walter took his last breath on this earth June 5, 2016 at the Bethany Care Centre in Cochrane. He will be lovingly remembered by his wife of 67 years Kay (Whitnack); his children: Anne (Bruce) Brander, Marion Wearmouth (Fred), Roy (Lucille), Allan (Nina); 12 grandchildren; 12 great grandchildren; his sister Shirley (Bob) Thomas; brother Dennis (Maida) Wearmouth; sisters-in-law Vernice Wearmouth, Dot Whitnack, Annie Clark, Marg (Bud) Pals; numerous nieces and nephews and extended family. Walter lived all of his life in the Bearspaw and Glendale districts between Calgary and Cochrane. 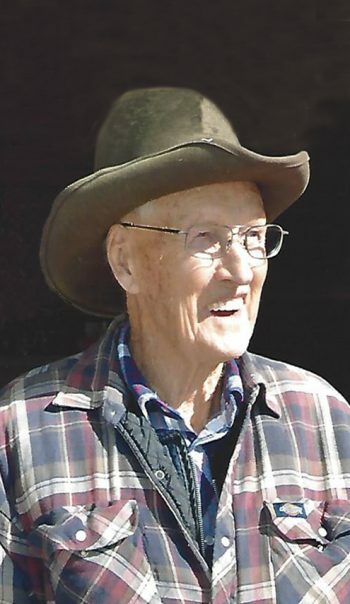 He and Kay milked cows, then raised beef cattle. They stayed on the farm until 2 years ago. Walter was active in the community, especially the Bearspaw Lions Club. Walter and Kay enjoyed travelling and curling. The family would like to thank everyone for their support, Bethany Care in Cochrane for caring for Walter since January, and Scenic Acres Retirement Residence in Calgary where he lived for a year. A Celebration of Life will be held at Bow Valley Baptist Church (54 West Aarsby Road, Cochrane, AB) on Friday, June 10, 2016 at 2:00 pm. In lieu of flowers donations can be made to Bethany Care Centre Cochrane, 302 Quigley Dr, Cochrane, AB T4C 1X9 or Alzheimer Society of Calgary, 201-222 58 Ave SW, Calgary AB T2H 2S3. In my life I have met a lot of men but only a very few great men. Walter was one. His down home wisdom and sound advice given quietly and without pressure has been a source of inspiration to me on many occasions. I am honoured that I had the opportunity to have met him. He will not be easily forgotten. Our thoughts and prayers are with the family at this time of grief. Loved having a talk with him and so did my kids. He always had wisdom to share and a joke or 2. The sky is a little brighter with him in it and he will be missed but we are all a little wiser because of him. Thoughts and prayers with his family from our family. We will miss Uncle Walt. We loved his spirit and wonderful sense of humor. Our thoughts and prayers are with Aunt Kay and our cousins and their families. I loved working with Walter, such a sweet, funny gentleman. I will miss seeing you and your lovely family at work. Uncle Walter not the biggest man in comparison to our other uncles but the biggest heart and one of the biggest personalities. Some of my fondest memories growing up were from the ranch and those many Boxing Day Family get togethers. Uncle Walter was always the life of the party from getting everyone up dancing to telling me it was ok to climb in the bull pen to retrieve my ball and laughing when the bull chased me up the fence then telling me the bull obviously wanted to play with my ball. Uncle Walter was a big part of my childhood and will be sorely missed. My condolences to Aunt Kay, Anne, Marion, Roy, Allan and the rest of the Family. Suffice it to say the loss is great but wherever he may be just got a huge upgrade. Walt was and is timeless. His gentle grace and charm will stay with me forever. Seemingly created out of leather and rope, this old cowboy blessed us all with his jokes and his laugh, his smile and with the love he so freely shared. Happy trails, Walt. Walter always extended a warm welcome whether we’d been away a week or a year. His spirit and generosity will be missed and the community has lost a treasure. Our deepest condolences to the Wearmouth Family. Our sincere condolences to Kay and Family. Walter is one those rare people that had this incredible ability to make everyone feel special and welcomed. We are so sad to hear of his passing and feel very blessed that we had the privileged to know him and call him our neighbor. His kindness, wit and wisdom is unparalleled and we as family are better people for knowing him. Our thoughts are with his family at this time of loss. Sadness and deepest condolences. My sympathy for you Kay, Marion & family. I always admired Walter who was always greeted me with a hug and smile. He was a man that will be greatly missed. Our thoughts and prayers are with Roy,Lucille.Mason and all the rest of the family at this sad time. Love from Shirley and family here on the island of St.Helena. The smile and the hat tells just who he was, loved to keep and cherish the things that made you part of his life.A community he loved and spent many happy times helping others Kay and family our thought and prayers are with you all. Many fond memories of Walter and his humour. So sorry to of missed his celebration of life but certainly thinking of you Kay and family on the loss of this great man. God Bless. On behalf of my family and the Bearspaw Lions Club, please accept our condolences on your loss. I met Walter almost 40 years ago when my father was a member of the Lions. Walter was always friendly, kind and willing to help out. It’s been a tough year for our club first losing Bob Norris and now Walter, both who were pillars of our club and community. Sincere condolences on the passing of Walter, he will be missed by all who knew him.